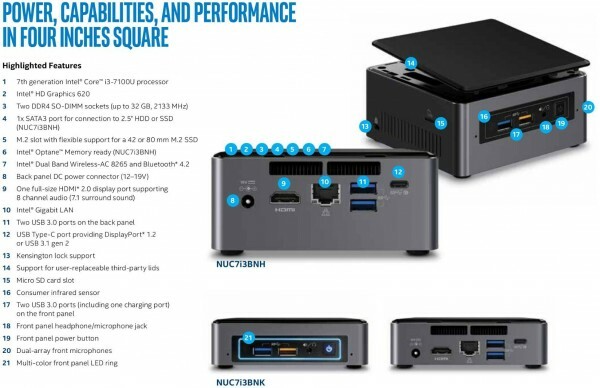 Intel's NUC kits are a revolution in PC design and the new 7th Generation continues that trend. They feature USB 3.0, HDMI 2.0, WiFi and Bluetooth and improved graphics processor for a full-blown PC housed in the smallest sized PC you've ever seen. Manage your life right now. The Intel NUC Kits built with the 7th Generation Intel Core processor give you the performance to handle anything your household throws at it. From sharing and backing up your files—including your digital photos—to managing your home automation, the Intel NUC sits at the center of your smart home or entertainment center. And its small size means it fits in the family room, the kitchen, the den, or wherever you want to place it. The slightly taller H-suffix Intel NUC Kits are Intel Optane memory ready, which makes you ready for the future. By easily installing and pairing Intel Optane memory with high capacity HDD storage media, you get amazing performance and responsiveness as well as shorter boot times, faster application launches, and more responsive browsing. the H-suffix Intel NUC Kits have room for a 2.5" SSD/HDD, so you have the room to store and backup all your important files. The slimmer K-suffix Intel NUC Kits are compatible with an M.2 drives for a lightning fast SSD. All of the Intel NUC Kits have some cool new features including dual-array front microphones so you can take advantage of Cortana's capabilities if you install Windows 10 with no additional hardware needed. There's also a front power button and a multi-color LED ring so you can personalise the NUC with the look you want, along with 7.1 surround sound via the HDMI port so that you can be deeply immersed in your music and movies. Or listen with headphones via the front microphone/audio jack. The choice is yours. With four USB 3.0 ports, including a charging port, you've got room to connect a USB keyboard, mouse, and printer, and still have a port to charge your phone or connect external storage. There's also a USB Type-C port that provides USB 3.1 for faster data transfer or DisplayPort 1.2. Intel HD Graphics lets you see images in brilliant 4K and adds better definition and clarity, letting you watch theater-quality 4K videos in your living room or see photos the way they were meant to be seen. And the 60 Hz refresh rate keeps mouse and cursor movement crisp, and your eyes from tiring when you're using your system for late night homework. The Intel NUC Kits come with Intel 802.11ac wireless, Intel's fastest wireless available today, for connectivity right out-of-the-box. This makes it simple to immediately access files in the cloud, and with built-in Bluetooth 4.2, you can connect wireless peripherals like headsets and keyboards.